In December of 1970, Srila Prabhupada spent fourteen days in Surat, India, with twenty-five of his Western disciples. Five years earlier, he had traveled to the west on the order of his spiritual master, Srila Bhaktisiddhanta Saraswati, to spread Krsna Consciousness. ISCKON was still a fledgling movement when he returned to India, but he had a strong desire to preach there. Srila Prabhupada’s approach to resolving India’s spiritual dilemma was very interesting: he returned with his Western disciples to show his countrymen how Vedic culture was capturing the imagination of the entire world. He proudly called his Western disciples, “dancing white elephants.” A white elephant is revered in India and is seen as a sign of royalty. Nothing could have prepared Srila Prabhupada and his disciples for the reception the people of Surat gave them. The people of Gujarat are famous for being Krsna’s devotees, but their enthusiasm in welcoming Prabhupada was unprecedented: the whole city closed down, throngs of people headed by the mayor greeted the party at the railway station, thousands attended the lectures and kirtans that Srila Prabhupada gave during his visit, and hundreds of people followed the devotees’ daily harinams. During those famous kirtans, shop owners would offer devotees various goods and wares, and people would garland them, anoint them with sandalwood paste and shower them with flower petals. For eight of their days in Surat, Srila Prabhupada and his disciples stayed at the home of Mr. Bhagubhai Jariwala, a wealthy and pious businessman. Each morning Srila Prabhupada would take a morning walk through the neighborhood, and would then give a lecture on the first floor of Mr. Jariwala’s house. Neighbors would often attend. 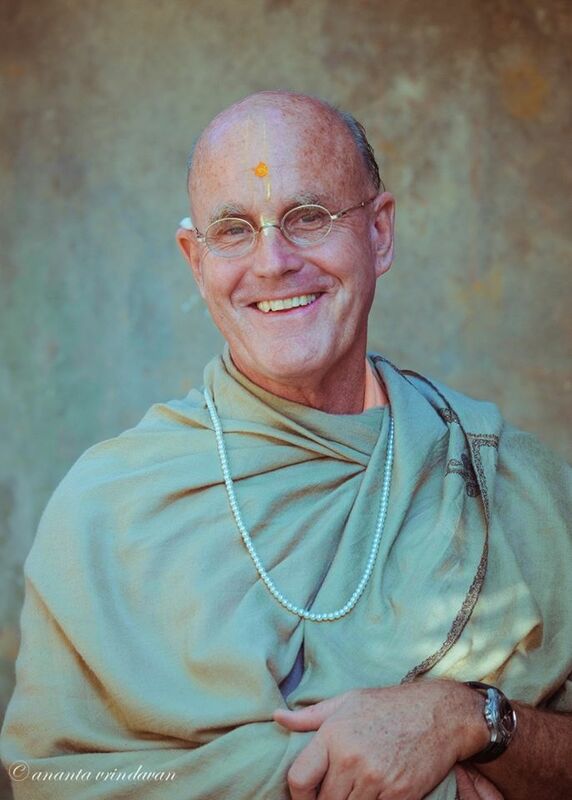 Forty-four years after Srila Prabhupada’s visit, I found myself in Surat with forty devotees while on a seven-week festival tour of the main cities in Gujarat. I asked the local devotees about Srila Prabhupada pastimes there and they surprised me by saying that our first program would be in a hall that Srila Prabhupada had himself held a program. That night thousands of people came to our four-hour show which included classical Indian dance, theater, martial arts, puppet shows and a big kirtan. I gave my lecture on Bhagavad Gita that night from the very spot in which Srila Prabhupada had spoken. I distinctly felt his presence and empowerment. The next day the local devotees offered to take our group to Mr. Jariwala’s house. It turned out the house was a small four-story apartment building; the windows and doors were all heavily bolted with locks and chains. Standing in front of the building, I noticed many people coming out of their homes, curious to see so many foreigners in their neighborhood. I tried to envision Srila Prabhupada at this heavily barricaded place. “We should still try,” I said. More and more neighbors gathered, and more people started speaking up. “Well, yes I am,” I said. “You are very fortunate,” one of them said. “Yes, I am,” I replied, trying to contain a wave of emotion that overcame me. I didn’t complete my sentence because I saw the people become suddenly anxious. The crowd parted and a large man, obviously the owner of the house, walked towards me. He was dressed like a perfect gentleman; he didn’t look like a drug dealer to me, but from the corner of my eye I saw some of the children run into their homes and close the doors. “I understand you want to go inside my house,” the man said in a deep voice. I couldn’t tell whether what he said was a challenge or a simple inquiry. He broke into a big smile. All my apprehensions melted away. “You are most welcome to visit my house,” he said. “I would be honored. I have heard of your spiritual teacher. He was a great saintly person. Great sinners need the mercy of saints.” He winked at the crowd, obviously aware of the rumors circulating about him. We passed row after row of large open burlap sacks full of various textiles. On the first floor, he led us into an airy and empty room. “You seem to know a lot about his visit, sir,” I said. “He is well known in this neighborhood,” he said. “Can we have kirtan in memory of our teacher?” I asked. Closing my eyes I began chanting Srila Prabhupada’s pranam mantra. When I opened my eyes I saw deep loving emotion on the devotees’ faces as they responded. I started chanting Hare Krsna and the devotees raised their arms and swayed back and forth. The owner the house also raised his arms and began chanting and dancing along with us. The local people broke out in big smiles seeing him. “That looks like the end of the rumors,” I thought, laughing to myself. I concluded the kirtan with the premadvani prayers, and the locals and the owner of the house joined the devotees as they bowed their heads to the ground. We thanked the owner of the house, and as he put the big locks back on the door he smiled at us. “You are welcome back anytime,” he said. As we gathered our instruments for harinam, one of the local men who had been in the kirtan came up to me. I decided to assess the situation before beginning the harinam. I walked thirty meters to the corner and surveyed the large open-air market; there were hundreds of people shopping at stalls selling a seemingly endless variety of goods: fruits, vegetables, textiles, furniture. One tall bearded Muslim man in the midst of the throng made eye contact with me, and held my gaze. He was surrounded by ten or fifteen other similarly looking men. “Wait here,” I said to the devotees. Taking a couple of male devotees with me, I crossed the street and walked toward the Muslim men. “Salaam-alaikum,” I said extending my hand to the man. “Wa alaykumu s-salam,” he replied. He took my hand and broke into a big smile. He was so friendly and open that I decided to take another step. “We would like to celebrate the glory of God by singing His names throughout the market place. Some unfavorable looks crossed the faces of some of the men. A few of them began whispering to each other. But the tall man, who obviously was prominent among them, shook his head. As the devotees chanted and danced in ecstasy through the market, I thought of how Srila Prabhupada had sent his disciples out to chant on the very same street so many years ago. A number of fruit vendors offered us bananas, apples and grapes. People smiled and waved at us as we passed, and when we stopped people rushed forward to dance with us. But I also noticed Abdul Qawi and Ahmed exchanging strong words with a group of young Muslim men. When Ahmed saw me watching he smiled and waved as if to say, “We have it under control.” A huge crowd gathered, and I saw Hindus, Muslims and Farsis all with big smiles on their faces. We chanted and danced for several hours and then got back in our vans to return to the temple. “Can’t we chant longer?” one of the devotees asked me. “Victory! Victory! Victory! I behold something wonderful! All the inauspiciousness of the living entities is destroyed. No one is going to hell.